In the last year, the Nasdaq Biotechnology Index has soared 48.3%. The Dow and S&P 500 are up just 7.3% and 8.6% in that time. But the biotech ETF that we've recommended to Money Morning readers has done even better. In the last 12 months, it has climbed 54.2%. That's more than seven times the returns of the Dow Jones. We've seen numerous "Buy" signals for biotech stocks in 2015. First was a report from the IMS Institute of Health that claimed global cancer spending topped $100 billion for the first time in 2014. That was 10% higher than it had been in 2013. "The increased prevalence of most cancers, earlier treatment initiation, new medicines, and improved outcomes are all contributing to the greater demand for oncology therapeutics around the world," IMS's Senior Vice President Murray Aitken said in a statement in May. That increased spending has pushed cancer-focused biotech companies higher in 2014 and 2015. According to Express Scripts, almost every specialty drug will see a hike in spending in both 2015 and 2016. 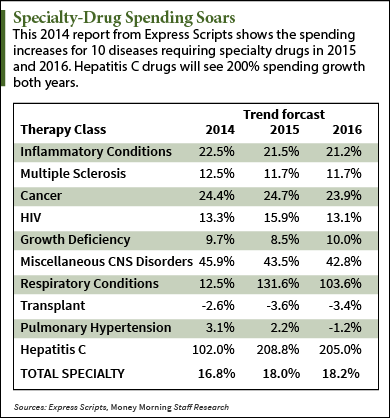 Hepatitis C treatments will lead the way, with growth of 208% in 2015 and 205% in 2016. 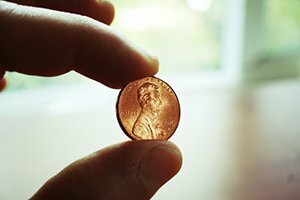 Spending on inflammatory conditions is expected to grow more than 21% each year. Multiple sclerosis spending will jump by 11% each year. 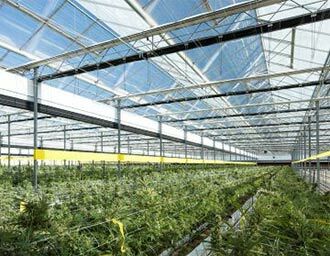 Respiratory conditions will see sales growth of 131% and 103%. Finally, an M&A boom in the pharmaceutical sector has helped lift biotech stocks and biotech ETFs in 2015. According to PricewaterhouseCoopers, the "life sciences" field had 35 M&A deals in Q1 2015. The life sciences industry is made up of pharmaceuticals, medical devices, biotech, diagnostics, and contract-research organizations. Those deals totaled $166.3 billion. That's more money than was spent during all of 2014, which saw M&A activity total $150.1 billion. In Q1 2014, just $46.5 billion was spent. Top pharma companies go on the hunt for smaller firms when their older patents are about to expire. Instead of developing their own drugs – which can take up to 10 years and $1 billion – they buy other companies with new drugs. This can send the share prices of both the acquired and the acquiring companies soaring.